If you google “joyful organizing” you will find 5.7 million results dedicated to this very popular lifestyle trend. Now, I know what you’re probably thinking, how can organizing be joyful? It’s tedious, takes forever and for many of us it can be quite overwhelming. I saw a feature on Marie Kondo and her approach to organizing and started thinking how great it would be to incorporate that into the steps of a design project. You can find thousands of articles on how clutter has negative effects on quality of life. In an article WebMD asks, “Is too much ‘stuff’ draining you?” They talk with organizational experts about how clutter affects people’s lives. One common description they hear from clients is, “their energy is drained, they can’t find things, and it’s beginning to interfere with crucial parts of life.” Well, we have some inspiring designs here to bring joy back to organizing and renovating. 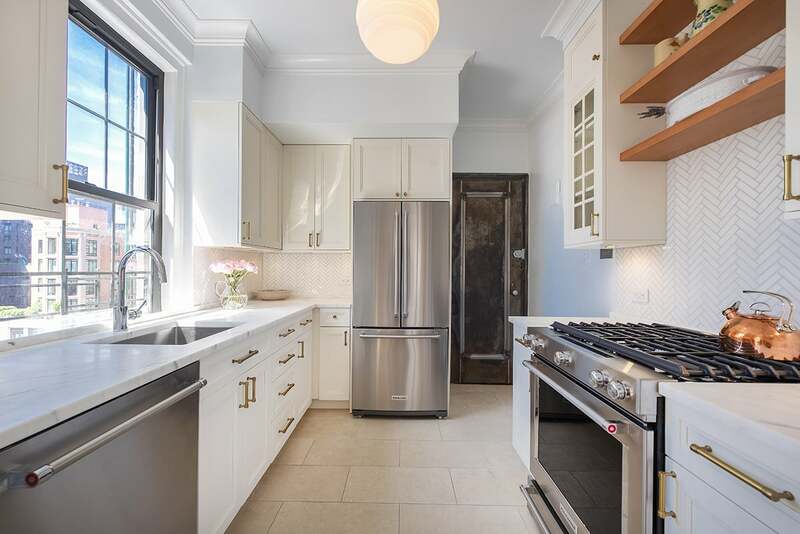 This open white kitchen offers up a ton of cabinet and counter space, but the design doesn’t stop in the kitchen. For continuity the same cabinetry is used for the media console giving the space a clean and organized feel. Here are a few organization tips and design options to keep your NYC apartment and life operating smoothly throughout the year. Marie Kondo’s philosophy is simple, “imagine your ideal lifestyle”. She talks about keeping items that spark joy in your life and working on removing the items that do not. Let’s run with this. Close your eyes and imagine your new kitchen. What are you envisioning? When you open your cabinets what do you see? How does it need to function in order to bring you joy in your space? Do you have pieces that make you happy or remind you of a loved one? Would you like to see them on open shelving or tucked away nicely for special occasions? 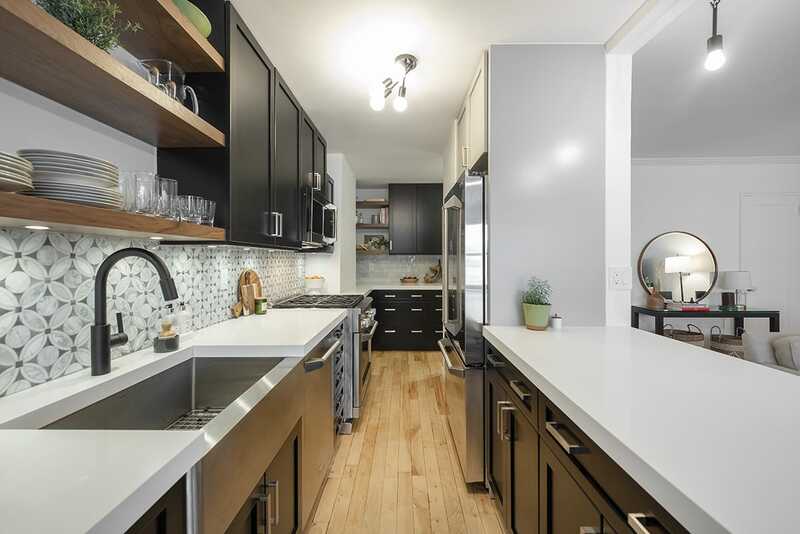 In the photo above we have floating shelves for dishes and glasses. 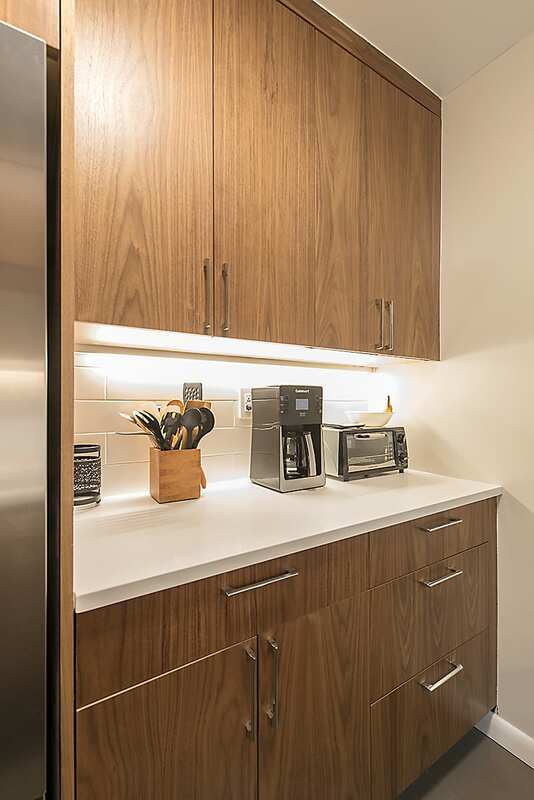 The client wanted easy access and decided to use the ample cabinetry to store away all other items. This allowed them to have no clutter on their countertops for a minimalist feel throughout the kitchen. Having a good balance of cabinetry and drawer space will help you organize your kitchen items for easy access. Deeper drawers can store pots and pans, plates and mixing bowls away making them easily accessible. This concept can also be applied to your bathroom and other areas of your home. 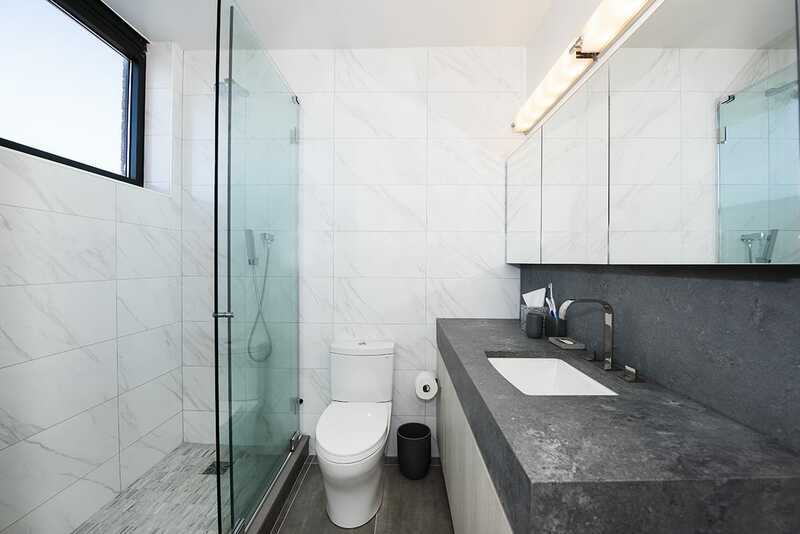 In this photo, our clients wanted to maximize their storage capacity by adding multiple medicine cabinets and extending the bath vanity the length of the bathroom. Again, plenty of storage means you won’t have an issue with cluttered counter tops. 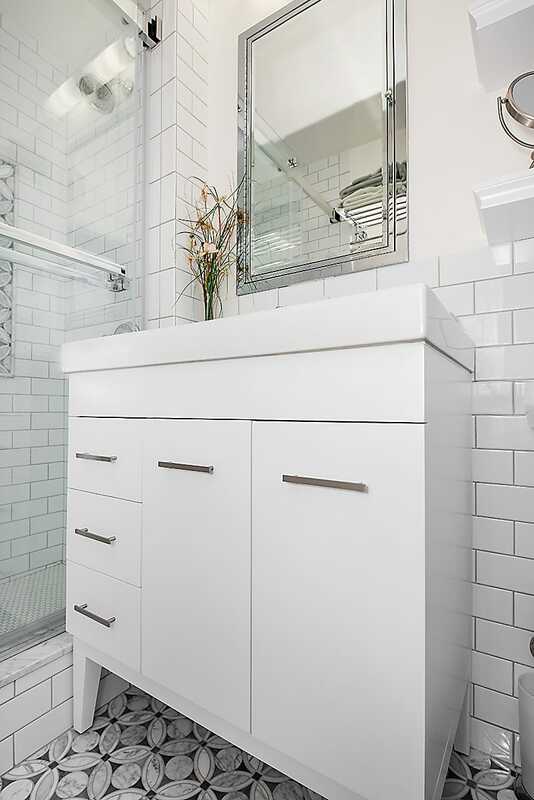 Below, a smaller bathroom can maximize storage with a base cabinet and drawer combo. If you’re planning a renovation think about what will go into your space before you think about how it will look. How does your space need to function? We hope you found this bit of information helpful, inspiring, and motivating toward renovating your kitchen or bathroom.